Not since the years following the Civil War have Americans faced such civilization-defining change. One of the best books I read during my two weeks’ holiday was Robert J. Gordon’s “The Rise and Fall of American Growth: The U.S. Standard of Living Since the Civil War,” which has great relevance to today’s conversation about the future of transportation. Gordon’s central idea is that the drivers of economic growth in the 100 years after the Civil War were civilization-defining transformations. Water and sewer systems, rail lines, public transportation, communications, and (perhaps most profoundly) the automobile connected cities, regions and eventually the entire country. 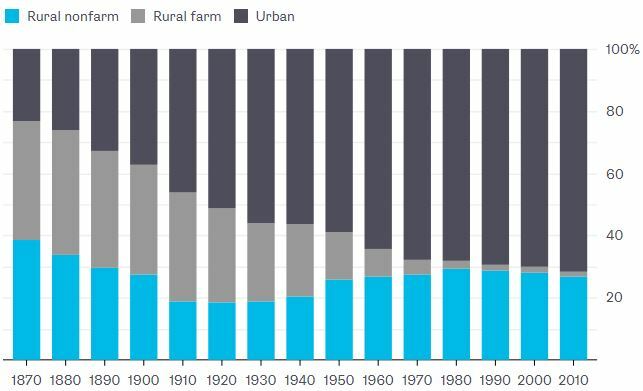 In 1870, rural dwellers who were not farmers made up the largest share of the population. By 1890, the urban population was bigger; a decade later, the urban population was larger than both nonfarm and farming rural populations. That trend has continued: The farm population has decreased from 40 percent in 1880 to less than 2 percent in 2010. The internal combustion engine and the automation it brought to farming also helped grind the farming population to a minimum; that same engine boosted the population beyond cities but not on farms. Source: Robert J. Gordon, “The Rise and Fall of American Growth”. Note: Exceeds 100 percent due to rounding. As my colleagues and I convened our first Future of Mobility Summit on Friday, we explored the many developments in transportation that could once again remake landscapes and economies. Electrifying cars, trucks and aircraft will upend the business models of oil majors and maybe even the geopolitics of entire regions. Autonomous vehicles could potentially redraw the maps of our cities and countrysides, and clog (or empty) our streets. Gordon notes that in the 1890s, the U.S. horse population rose by 25 percent — not despite the arrival of the railroads, but because of it. By making previously remote areas accessible, railroads induced demand for more “last mile” transportation services. Autonomous vehicles could provide last-mile services to connect train or bus commuters, and they could also increase total miles driven as people become comfortable with longer, but passive, commutes. They could mean more cars on the road. On the other hand, fully autonomous vehicles, fleet-owned and -operated, could significantly reduce the number of cars. Always-on fleets don’t have to be garaged in city centers or parked in driveways, eliminating the need for personal cars and transforming transportation into purely a service. After the Civil War, U.S. consumers spent 44 percent of their money on food; that number today is less than 8 percent. 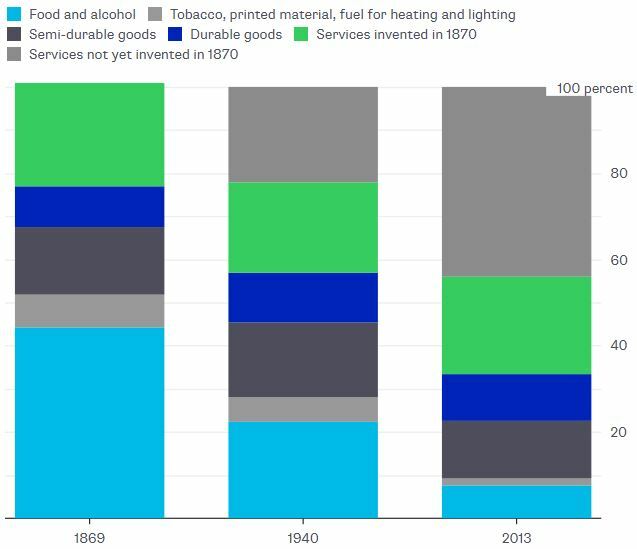 Services were less than a quarter of the consumption basket in 1869, and are two-thirds of it today. In 2013, transportation accounted for 2.9 percent of expenditures, hardly more than in 1940. Autonomy could increase that figure while simultaneously shrinking spending on cars. The 2030 version of this chart could require a whole new category of services that don’t yet exist — among them, the car that drives you.